Peertechz, a well-known provider of scientific, technical and medical journals is facilitating the availability e-Books platform designed to increase the productivity and efficiency of health professional, librarians and students. Peertechz eBooks will deliver educational health and medical materials whenever and wherever it's required, on any online device. In today’s digital world, researchers mainly prefer e-resources and e-books due to availability, environment and cost. Peertechz is leveraging on e-Books as an alternative delivery option of quality content in science and medicine information to the next generation of health and medical professionals. We wish to provide today's tech-savvy medical researchers and students with the ability to access their reference books at any time from any device. Academicians can access to multiple eBooks helps expand content to aid additional reading and cross-referencing. eBooks will provide students an alternative resource delivery to learn trusted health and medical content on the go on any Internet device. Peertechz e-Books brings together innovative digital publishing with leading topics in scientific, technical, engineering and medical research to create the essential collection of books for a digital world. Our eBooks programme will allow authors and readers to benefit from cutting edge digital publishing capabilities, rapid publication times, and enhanced reader experience as standard that users have come to expect from our online publishing platform. With our e-book and journal production being HTML driven, we are able to offer authors the opportunity to publish content in new and exciting ways with interactivity and user customization. By choosing to publish with us, your book will become part of a collection that will play an essential role in communicating scientific, technical, engineering and medical research of the highest quality. We are able to offer all our authors true global exposure, with eBooks being hosted on integrated and dynamic platform of Peertechz. 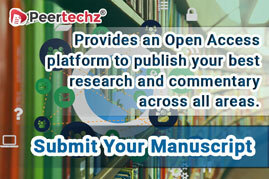 Swift submission process – The authors can directly submit their eBooks/chapters to our editorial office via email at ebooks@peertechz.com. After submission, the author will get instant acknowledgement from peer-review department. Open Peer Review – For every e-Book a thorough and rigorous open peer review process is conducted by a highly experienced and neutral panel of experts to ensure originality of the contents. Open Access: On the discretion on authors, e-Books can be allowed for open access and downloadable content with potential to reach a larger audience of readers. Publication in multiple formats – The e-Books will be published in various electronic formats such as PDF, HTML and XML formats. Also Reprints will be available on demand.